In general the participation of civil society is low. 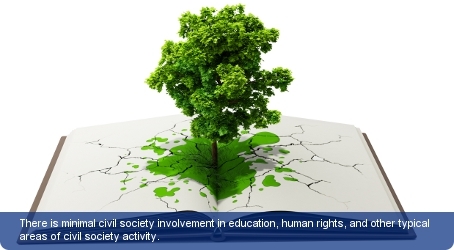 Where they exist civil society and non-governmental organisations are involved in education, human rights, and other typical areas of non-profit activity. The activities of a few non-governmental organisations such as the St Lucia Crisis Centre and the Aids Action Foundation are well documented. The St Lucia Crisis Centre is helping school dropouts, pregnant teenagers, victims of domestic violence and sexual abuse. The Aids Action Foundation, has since its founding in 2000, developed and implemented programmes in general HIV/AIDS education and awareness; capacity building of its member organisations and many other initiatives that help to mitigate the spread and impact of HIV/AIDS. Primary international NGOs which function in the country include Oxfam, the Red Cross, Save the Children, HelpAge International and the Fairtrade Foundation. The latter has successfully created a link between the country’s small-scale farmers and the world market, whilst Oxfam has been similarly working to help promote the marketing of local agricultural produce to St Lucia’s hotels. Established in 2005, the Trade Union Federation represents all trade unions except the National Workers Union (NWU). The St Lucia Civil Service association is the largest trade union on the island with the NWU and the Seaman and Waterfront General Workers Union (SWGWTU), which have memberships of up to 3,000 people.